About half of nationwide communes are targeted to meet new-style rural area standards by 2020, deputies said before the second session of the 14th National Assemly (NA) closed in Hà Nội yesterday. Legislators adopted the goal as part of a resolution on enhancing the efficiency of the national target programme to build new-style rural areas along with agricultural restructuring. They also proposed that there should be about 15,000 agricultural co-operatives and co-operatives unions with efficient operations and proper linkages by 2020. By then, the ratio of agricultural labourers is expected to fall to less than 40 per cent of all labourers in the country, and the average income of rural residents is set to be at least 1.8 times that of 2015. NA Deputy General Secretary Lê Bộ Lĩnh said in a report that as of the end of last year, more than 1,500 communes, or some 17 per cent of nationwide communes, met new-style rural area standards regarding electricity, irrigation, income, security and master plans. The country mobilised VNĐ851.38 trillion (US$38.52 billion) to implement the programme from 2011-15, and the ratio of poor rural households fell from 17.4 per cent in 2011 to 8.2 per cent in 2015. However, Lĩnh said shortcomings remained in implementation. Authorities had inadequate directives for farmers, technology application in agricultural production remained limited and connections among production, processing and distribution phases were weak. There was also a lack of farm produce carrying national brand names with high added value and pollution endangered the rural environment. The resolution said the country must renew agricultural production methods and restructure agriculture to cope with climate change and protect the environment. It must also revise land policies to stimulate land concentration, a factor needed for mechanisation in farming, while facilitating enterprises to invest in agriculture, and foster linkages among the government, businesses, scientists and farmers. It must also prioritise funds for production models that generate jobs and income, and areas populated by ethnic minorities in tough conditions. Policymakers also passed a resolution on voters’ questioning of the authorities. They approved of having NA bodies, the Government, the Supreme People’s Court, the Supreme People’s Procuracy and relevant agencies answer more than 2,400 questions posed by voters to the NA during this session. The NA asked the Government and Prime Minister Nguyễn Xuân Phúc to direct ministries, sectors and localities to adopt measures to progress in several major areas next year. In industry and trade, authorities must tackle inefficient public projects and strictly treat those to blame for the bad investments. They should also intensify market management to tackle counterfeit and smuggled goods. They should build a roadmap to develop the automobile industry over the next two decades, and strengthen the supervision of hydroelectric projects. Regarding environmental protection, the authorities should revise regulations to ensure that investment projects are environmentally-friendly, besides moving production units from residential areas into industrial complexes. Taiwanese-invested steel firm Formosa, which caused mass fish deaths along the central coast this year, will be closely monitored. Authorities must also improve education and training to create quality human resources and trim staff from administrative organisations. Legislators assigned the NA Standing Committee, the Government and law enforcement agencies to deal with former Minister of Industry and Trade Vũ Huy Hoàng, who misused his power in appointing executives and badly affected the prestige of the Party and State. These agencies are to speed up inspections to prosecute officials and civil servants making similar mistakes. NA Chairwoman Nguyễn Thị Kim Ngân said corruption and misspending of public resources remained serious, while the country is still confronted with various issues in the economy and improving healthcare, social security, traffic safety and urban management. “These worry people and voters nationwide. The government at all levels must make every effort to handle shortcomings for stable and sustained economic development with reasonable growth,” said Ngân. “Action is needed to assure social welfare and improve people’s lives, maintain political stability and consolidate national defense, besides assuring social order and security in 2017 and the years afterwards,” she said. According to deputy Bùi Văn Phương of Ninh Bình Province, this NA session has been an eventful one. He said although two-thirds of the deputies are newly elected, the quality of their work is good. “A noteworthy point is the democratic atmosphere: deputies discussed and debated in a straightforward manner with a high sense of responsibility." “The newly allowed direct debate between deputies and with ministers creates a platform for deputies to express their opinions, which helps ensure better and more reliable NA decisions,” he said. However, Phương suggested that in the next sessions, debates should also be conducted between deputies and law compiling and appraisal bodies, not just among deputies and ministers. 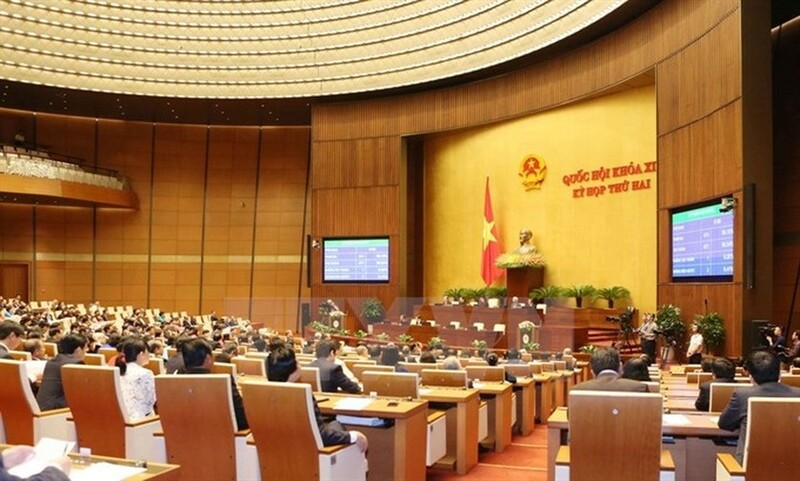 Deputy Phạm Tất Thắng--from the southern Vĩnh Long Province--said the NA’s session has yielded fruitful results in all three aspects of the NA’s functions: law-making, supervising and deciding on important national issues. He also praised the quality of Q&A session: “Unlike in the past, NA did not ask only a minister to respond to deputies’ questions about a certain issue but picked up a group of issues for both ministers and members of the Government to answer." “This shows the co-ordination and shared responsibility among ministers and Government members in addressing the issues,” he said. Cấn Văn Lực, an economic expert and senior advisor of BIDV Bank Chairman, praised the NA’s adoption of crucial plans that will greatly impact the middle- and long-term socio-economic development of the country, such as the plan for management of public debts, public investment and finance. However, he said it would be very challenging to realise some of the NA’s goals. “For example, the goal of attaining a GDP growth of 6.7 per cent in 2017 and keeping budget deficit lower than 3.5 per cent of the GDP next year. They are both very difficult to achieve,” he said. While agreeing with the NA’s decision to cancel the Ninh Thuận nuclear power plant due to economic difficulties, Lực said the plan should be put on the table again a more appropriate time in the future, claiming it would serve the power demand of the country in the long term. Lực also hoped that the quality of laws will improve further by following proper procedures and taking into consideration opinions of related parties such as enterprises, associations, and experts. “The number of full-time deputies should also be increased. Deputies should also have assistants in terms of legal grounds,” he said. Nguyễn Văn Thọ, 72, a retiree in Hà Nội’s Tây Hồ District, said that he appreciated the deputies’ work during NA meetings. “They went straight to the point when discussing bills, socio-economic plans, questioning four ministers at Q&A sessions and debating with them. The deputies did a good job on raising issues that voters are most concerned with"
“However, I’m not satisfied with the answers of the four ministers at hot seat during Q&A session," he said. “Minister of Home Affairs Lê Vĩnh Tân could not answer the question concerning State official Trịnh Xuân Thanh’s successful escape after being found violating economic management regulations and causing serious consequences including the loss worth VNĐ3.3 trillion as he was chairman of PetroVietnam Construction Corporation."